To understand how decentralized prediction markets work, it is helpful to first understand what a prediction market is. A prediction market is a market, like a stock market, that allows people to buy and sell shares of things. However, unlike a stock market, a prediction market allows people to buy and sell shares of predictions of events, rather than shares of a business. So, for example, with a prediction market, a person may buy shares of Donald Trump winning the next presidential election vs. the democratic challenger. The way that this works is that every event is given a certain probability for each result to occur. So, for example, imagine that in the next presidential election, Donald Trump is given a 60 % chance of winning, and the democratic challenger is given a 40 % chance of winning. Every share purchased for either candidate would be based on this percentage. So, if you wanted to buy one share of Donald Trump winning, and if the shares were based on a dollar, then it would cost 60 cents. If you win, you would be given the 40 cents that someone else lost on his or her democratic challenger bet. So, you would end up with one dollar, and earn a return of 40 % for your bet. So, essentially, prediction markets are just markets that let people bet on their predictions for various types of events. Decentralized vs. Centralized Prediction Markets? Decentralized prediction markets are similar to centralized prediction markets, except they have a few key differences. With a centralized prediction market, one central authority regulates and controls the entire prediction market. This means that this authority supervises the taking of bets, the selection of the events to bet on, and also the payouts. With a decentralized prediction market, there is no central authority performing these activities. Instead, the integrity of the market is maintained by thousands of users whose activity and reporting validates outcomes. The integrity of the market can also be maintained by linking the market to a blockchain such as Ethereum. If a prediction market is linked to the Ethereum blockchain, then smart contracts can be used to make sure that all correct payments go through automatically, when they are supposed to go through. Basically, decentralized prediction markets are just prediction markets which are more open and free, and which are not dependent on any one person or company to run effectively. There are many benefits of decentralized prediction markets. One of the most important is that they allow anyone to create a topic that can be bet on. In other words, with decentralized prediction markets, anybody can be a market creator. So, for example if you wanted to create a market which lets people bet on whether or not the government will require all vehicles to get at least 50 miles per gallon by the year 2020, then you could do this. If you wanted to create a market for whether or not it will snow in New York City on January 20th, this year, then you could do that too. You can create any kind of event bet you want with a decentralized prediction market. 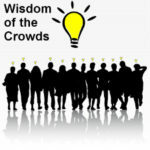 However, just because you create a market does not necessarily mean that people will bet on it. Decentralized prediction markets are very free markets which means users will flow to the markets and the betting options that are the most appealing to them. Another key benefit of decentralized prediction markets is that they prevent one central authority from manipulating the payments. With centralized prediction markets, a central authority can simply choose not to pay somebody out if he or she disputes the result of the event. With decentralized prediction markets, manipulation is infinitely more difficult, and possibly even impossible due to nature of the setup of the market. Decentralized prediction markets also have considerably lower fees than centralized prediction markets. This point is of particular interest to anyone who frequently makes bets on prediction markets. Fees can add up over time, so the lower these fees are, the better for users. One final benefit of decentralized prediction markets is that they provide incredible predictive data. This is because if you have 20,000 people all betting that one outcome is going to occur, and only 3,000 betting that the other is going to occur, then this can help companies to better predict events. The predictive data gathered from decentralized prediction markets can be extremely valuable for people and businesses who know how to use it correctly. There are a number of decentralized prediction markets that are currently being built, based on various blockchains. 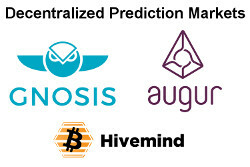 For example, Hivemind, Augur, and Gnosis are all decentralized prediction markets that are currently being constructed and will probably soon be ready for public use. Hivemind will run on Bitcoin, and both Augur, and Gnosis will run on the Ethereum blockchain. So, to use these prediction markets, you will have to download a decentralized app (DApp), for the prediction market. Once you do this, you will be able to place bets on events that are already listed which you like. You will be able to bet as much money as you can afford. The bets will typically be placed in cryptocurrencies. Then, one the outcome occurs, the network will validate it, and if you win, you will be given money. If you lose, your money will be given to people who have won. Through these DApps, you will also be able to set up your own events that can be bet on. Then the process of people betting on, validating, and being paid out for events occurring will apply to your listed event. Decentralized prediction markets could easily create a brand new industry and there is a good chance that this industry could become a very popular way for people to make bets. One of the biggest challenges that decentralized prediction markets face is that they could create a lot of controversy due to the fact that people may begin to list events to be bet on that could be seen as highly undesirable. For example, someone may one day list a event such as a political leader being assassinated on a decentralized prediction market. This could be seen as very negative by governments because it essentially means that lots of people would make money if one of their leaders is killed. Anything that creates financial incentive for political assassinations is likely to be a red flag for governments. So, there is a high probability that governments could try to interfere with decentralized prediction markets as soon as they start to become heavily used. This could result in legislation being created which bans decentralized prediction markets from listing certain types of events on their markets, which political assassinations likely to be at the top of this list. 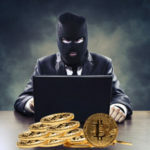 If this occurs, then it will be up to the individual DApp companies to make sure that none of these types of events are listed on their networks, or else face potential legal challenges. Scaling could also potentially be an issue for decentralized prediction markets. This is because, as these markets grow in popularity, they could experience a major surge in traffic and use. If this occurs, then the DApp companies could struggle to accommodate such a massive surge in popularity. This is essentially what happened with Bitcoin. The scaling problem for Bitcoin is still being attempted to be solved. So, it would be wise for Augur and the other decentralized prediction market networks to factor in scaling issue solutions to their DApp designs before they start to go live to the public. This could prevent them from experiencing major problems as they start to expand. Many people around the world like to bet on and invest in things. Sports, cards, stocks, and futures are all things that people frequently bet on and invest in. While many people are content with these things, being able to bet on random events that may or may not occur in the future is likely to be a betting/investing option that will appeal to large numbers of people. So, decentralized prediction markets could soon become very popular. In the past, decentralized prediction markets were not really possible to build on the scale and with the quality that they are being built today. This is because it is blockchain technology which gives decentralized prediction markets a lot of their power and their strength. Blockchain technology has only been around for a little under a decade. Using decentralized prediction markets to bet on events will certainly be risky in many cases. However, due to the enormous opportunity to make money by doing so, this type of betting could appeal to many individuals. There is also a chance that people will become subject matter experts and develop skill for predicting certain events accurately. For example, some people may begin to study political data with high intensity in order to be able to accurately predict elections. Others may study pop culture, sports, weather, etc. Once the decentralized prediction markets are up and running, there should be many different topics to choose from. The variety of topics can allow people to leverage knowledge that they may already possess to make predictions about events. This, combined with research and potentially even mathematical formulas could help people to become better and better at predicting events. There is a very good chance that some people will make fortunes on decentralized prediction markets. However, many others will certainly lose money. So, if you plan on using decentralized prediction markets to bet on the outcomes of events, make sure that you bet responsibly, and that you always do your research in advance to increase your odds of success.